A pocket-sized dry herb vaporizer. The Healthy Rips FIERCE is the latest portable dry herb vaporizer to hit the market. Healthy Rips has WOWed me in the past with the Fury 2, which is one of my favorite budget vapes! The Fierce is the new Big Brother of the Fury 2, packing a larger bowl and several other sought after features. The Fierce is a high-quality device with luxurious features and fantastic vapor. For a $220 vape, the Fierce packs a lot of features and brings more value than more expensive dry herb vapes. The Good – The Fierce feels really great in the hand and it’s a pleasure to use. The plastic mouthpiece is comfortable and easy to deal with. The glass mouthpiece is a wonderful accessory that lowers maintenance and decreases the bowl capacity. The large screen is loaded with great information including a session timer, temperature, and battery indicator. The session timer is adjustable in 10-second increments, up to 8 minutes long! The Fierce produces plenty of vapor and the vapor tastes and feels great! 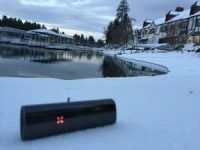 It vaporizes .1 to .15 grams of 62% humidity kept cannabis in 12 minutes or 20 to 25 puffs. The Bad – The heater of the Fierce is about the same power as the Fury 2. With the larger bowl of the Fierce, the convection heater just can’t keep up with the heaviest of hits. With the heater set to 380, a 15 second draw will drop the convection heater temp down below 350. You can shorten your draw or compensate with a higher temperature. The Fierce is a nice vape. It’s refined and snazzy. At $220 the Fierce offers a lot of value. 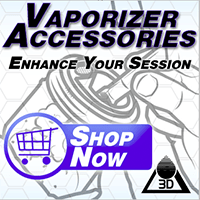 The vapor is extremely reliable vapor and the vape is simple to use and maintain. 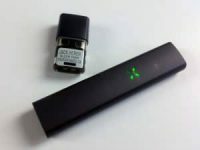 While the Fierce is not the Mighty Killer many of us wanted it to be, it’s still a wonderful dry herb vape that’s $76 cheaper than the Mighty. Plus the Fierce has a removable battery, something the Mighty lacks. 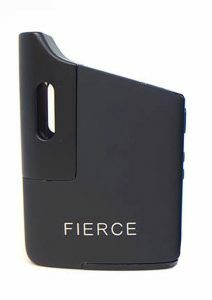 The Fierce is available directly from Healthy Rips. The Fierce is also available at Puffitup.com. The Boundless TERA and the Healthy Rips FIERCE vapes are very similar. They each offer nearly identical features at the same price. Both the Tera and the Fierce feature removable batteries, but the TERA uses non-proprietary 18650 batteries while the FIERCE uses a proprietary battery. Both devices include two mouthpiece options, plastic and glass, but the FIERCE mouthpieces are technically both glass vapor path. The glass mouthpiece from the TERA still has more plastic in the vapor path than the plastic mouthpiece from the Fierce. The Fierce charges via USB-C and takes 2-3 hours. The TERA batteries can be charged externally with a common battery charger or internally via micro-usb. The Real Difference between the these two dry herb vaporizers is in the convection power and resulting vapor. The TERA has one of the most powerful convection heaters available in a portable device. Ripping hard and long on the TERA produces thick dense clouds of fast and thorough extraction, but it takes a 10 second draw to really get it going. You can rip on it long and hard and it will not back down. The Fierce doesn’t need a long draw technique to produce vapor, but the Fierce doesn’t rip nearly as hard. The Fierce loses significant convection power after 10 seconds of draw. If you’re looking for a hard hitter, you’ll favor the TERA. If you’re looking for smooth reliable vapor in an easy to carry vape, the Fierce is the best value. dont care (i get what you mean) but thought you might. thanks for the review! Hey Troy, big fan of your videos. I am buying my first dry herb vape and I am torn between the boundless Tera or Healthy rips fierce. I will probably use this vape as a everyday one. Curious on your take.